OneDrive for Business is often confused with its brothers OneDrive, SharePoint and Office 365. But it is actually way more than that as well as made of those... Pretty misleading, I know! So let's try to clear things up a bit. A quick overview on OneDrive and OneDrive for Business. What are they and how are they different? Hi! My name is Benjamin Niaulin. I'm a SharePoint MVP working here at Sharegate in Montreal, and welcome to another episode of Between Two Farms. This time I want to touch on a particular subject that is something that I really like because it is very much something we're talking about these days and that's OneDrive for Business. Now, not to be confused with OneDrive, of course, or the link OneDrive in SharePoint. Yeah, I know, it's confusing and I want to try to shed some light on it. There's already a very detailed blog post which I invite you to check out of course, but first we got to understand what is OneDrive? Let's forget OneDrive for Business. OneDrive is a free, public tool by Microsoft, of course, and this is very much in competition with Dropbox and other services like Box that you may have found out there. The OneDrive is associated with your Outlook.com account, formerly Hotmail.com, and you can just put your folders, your files, your videos, your pictures on there and get them later. For example, if I was at school and I was taking notes for my classes and so on then I would be working from my Word, from Excel, from PowerPoint, and instead of saving my files on my desktop then I would save them to my OneDrive which allows me to go and get them later on. So great! But it's missing all of these advanced company features or business features, if you know what I mean. How do you get content approval? How do you make sure that the versioning is in the right version order with minor versions, with major versions, and all of that advanced stuff that is required when we are working in the office. That's where OneDrive for Business comes in. It's a place where you can put your document, your files, your pictures, videos, depending on what the business allows, of course, but it will allow you to do a little bit more. It will allow you to, of course, synchronize your files and make them available offline, but it has the extra features, if you want, like the advanced versioning, like the advanced content approval, and all of these other features mentioned in this blog we're talking about. Now, the problem with OneDrive for Business is that it is often confused with what it really is and the back as the platform hosting OneDrive for Business and that's SharePoint. SharePoint is a platform that we know and love for many, many years now that helped us do collaboration. And inside of SharePoint there has always been two things that have tried to be but were never really successful, and that's the My Site and Groove. You guys know what I'm talking about? Right. My Site, Groove, OneDrive for Business, I'm still confused! So the My Site in SharePoint is a personal team site, if you want. Think of the team site and pretend that for every single user in your company, your organization you give them a team site but for them alone, not for anyone else. And that team site's title will be the name of that user, that employee. Right? So that's what OneDrive for Business, as a brand, really is. It's My Site, which essentially is you giving individual team sites that are not for any team but for individual users in your organization. So John will have OneDrive for Business but it's actually his own little team site for himself. And inside of it you'll have document libraries, that person can also create lists, other document libraries if he wishes, it's his own OneDrive for Business. Now, the other feature, that used to be called Groove for SharePoint Workspace, is the ability to be able to synchronize offline what you're working on online. And that's a bit like, if you're familiar with Dropbox, the way where you click on synchronize and it becomes available on your desktop for you to navigate and access your documents and synchronize back online. That's the ability that we want to go get with OneDrive for Business as well. So along with giving individual sites to everyone in your organizations and a document library for them to put documents in, OneDrive for Business also allows them to synchronize offline in there computer. But that's not it, it's also on their devices, because there's an app for iPhones, iPads, the other devices out there, Windows phone, of course, and that makes it available to anyone, from anywhere. But, of course, it's always secure, it's always based on https, your user authentication and password, two step verification authentication, so there's lots to be had. 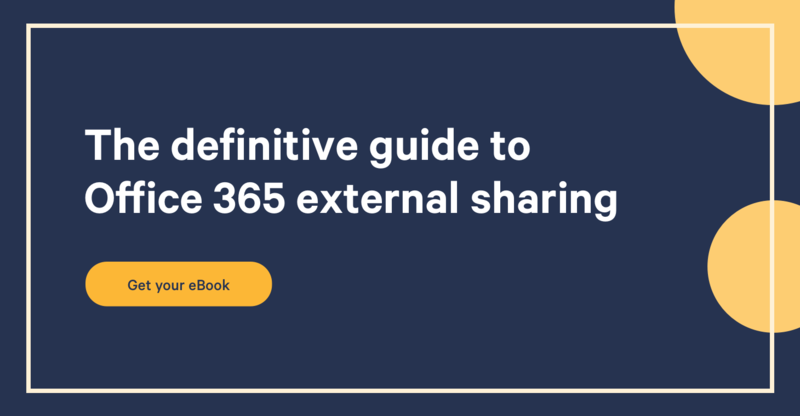 OneDrive for Business sounds complicated, but think of it as SharePoint for individual users that also allows you to sync. Want to learn more? Check out the blog. Again, this was another episode of Between Two Farms. Thanks for attending and I'll see you at the next one!